Tartu and the local governments of South Estonia are working closely together to ensure that Tartu becomes the 2024 European Capital of Culture. This was the agreement reached by the mayor of Tartu and the leaders of local governments from South Estonia during their 24 January meeting at Tartu Town Hall. ‘The City of Tartu is a centre of attraction for all of South Estonia. Therefore, our wish to include the surrounding local governments in our candidacy for Capital of Culture from the very beginning, and to do it together, is self-evident’, said mayor Urmas Klaas. 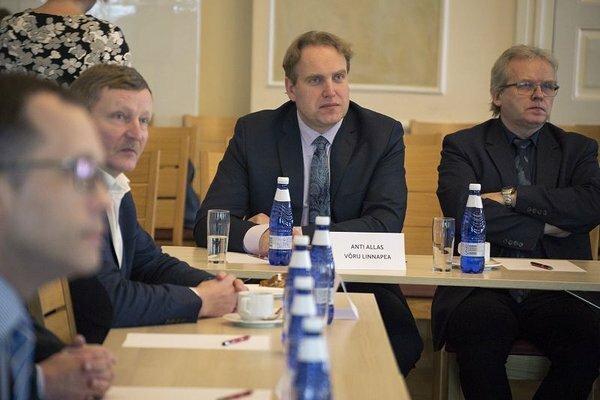 Tartu explained the goals of its aspiration to become the Capital of Culture to local government leaders from South Estonia and provided an overview of the opportunities available to South Estonia in connection with Europe’s most prized cultural project. Local government leaders meeting at Tartu Town Hall discussed the opportunities and outlooks for cooperation which Europe’s most prestigious cultural project will create for the entire local region. In addition to cultural cooperation, topics such as tourism, the environment, investments, etc., were also under discussion. Taking part in the meeting were local government leaders from Võru, Setomaa, Valga, Kanepi, Kambja, Rõuge, Antsla, Otepää, Elva, Nõo and Tõrva. Tartu has decided to stand as a candidate for the 2024 European Capital of Culture. The title of European Capital of Culture has been worn by all of the most important cities of Europe. Many of them decided to apply together with the surrounding region, thereby boosting the development of the entire region. A decision on the European Capital of Culture from Estonia will be made at the end of 2019.